Prayer walk is simply walking and praying. We plan to walk around our schools to dedicate our campuses and our year. 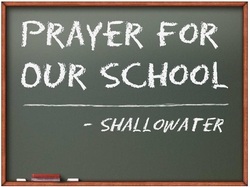 We'd like to get one family a day to pray each month for our school, our teachers, and our students. A modest, but powerful group of families gather at the Elementary Playground to pray together and then begin walking the campus, praying for a blessed school year. The first week of school teachers were sent an email letting them know that they'd been prayed for and the response was overwhelming.